House is the place where we live together with our family members. We grow with good manners and blessings of our parents & family member. It is the place where all family members share their emotions, feelings, good/bad-times. It is very necessary that environment of our house must be harmonious and comfortable, full of positive energy. Every people expect the happiness and prosperity in that house. It all depends upon the Vastu for House. If our house is to constructed according to vastu then negativity will be increased. So it is very important to make house according to the Vastu for House. House is not brick and mortar alone, but it has a soul of its own. House should be constructed or purchased on an auspicious date and time. Good Nakshatra to be determined by an astrologer or expert. Before laying the foundation of the house, sprinkle water, preferably sacred water on all the sides of plot. Thereafter burry a pot containing milk, silver & water from the Ganges river or any holy river. In the foundation of the house burry that pot for 43 days. If there is no bad effects such illness, trouble, loss etc. during these days. If it happens then remove the pot and place it in running water or river. Donate something to the poor or a place of worship before entering the house. It helps in good Vastu for House. Bury a piece of silver washed in milk and smeared with honey in the foundation of the house for peace. Before commencing work on a house, first find out the auspicious date, time & Nakshtra. Measure the whole of the land/ plot along with its corner. Rectangular/Square plot having four corners are the most auspicious according to good Vastu for House. The following corners are considered inauspicious. Eight corner plot : Will get the malefic effect of Saturn no.8 i.e. will cause disease & Death in the household. Eighteen- Cornered Plot : Will cause loss of Gold, Silver. Three/Thirteen Cornered Plot : Will give worst effect of malefic mars.i.e. relatives, brothers may be destroyed. Incidence of fire or death. Five Cornered Plot : Children will suffer & may be even destroyed. 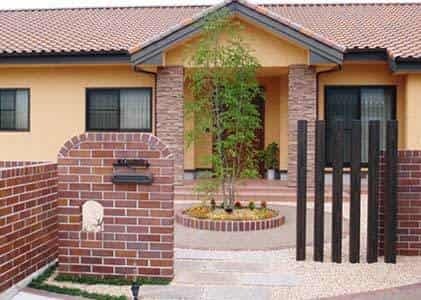 According to the Vastu for House the main gate for entrance is very important. It should be in right direction so that positive energy can enter in the house. If the main Gate for Entrance is towards ‘East’, it would be the most auspicious. The nest best towards the ‘West’. Entrance gate towards ‘North’ or hill side is good for meditation or doing good deeds. Entrance gate towards ‘South’, is the most inauspicious. It is just like a cremation ground where everything is destroyed in fire. Consult Famous Astrologer in India for more Astrological help.